Where Do Backpackers Go in South Korea? A Review of Hostels and Guesthouses. How much money will you need in South Korea? ₩108,996 ($96) is the average daily price for traveling in South Korea. The average price of food for one day is ₩24,170 ($21). The average price of a hotel for a couple is ₩111,956 ($99). Additional pricing is in the table below. These average travel prices have been collected from other travelers to help you plan your own travel budget. How expensive is South Korea? How much money do I need for South Korea? South Korea is a very modern and cosmopolitan country on the southern half of the Korean Peninsula. It's one of the most densely populated countries in the world, yet currently has a very low birthrate. There is a large Christian and Buddhist population spread throughout the country. The Korean culture is a fascinating one. It is heavily influenced by the Chinese culture, but there remain major fundamental differences between the two, the most obvious being the food, spoken language, and written language. The Korean population is very proud of their distinct culture and you are sure to experience this during your time in South Korea. In addition to a unique food and architecture style, Koreans enjoy sports, with some of their favorites being baseball, soccer, and badminton. Many people overlook South Korea as a travel destination in part because it is considered so modern and lacking in some of the traditional culture found in other nearby countries. Those who take the time to visit this fascinating country will find that it offers a unique perspective into the Asian culture. South Korea is also easily accessible in route to other travel destinations throughout Asia. Many flights have a layover at Incheon International Airport. It is recommended that you extend your layover for at least a few days so you can explore parts of this interesting country. South Korea is divided into several distinct regions. As a tourist you'll find something interesting in each one, but some of the more popular places to visit include Gyeonggi, where you'll find the city of Seoul. Gangwon is well known for its natural beauty, beaches, and ski resorts. North Chungcheong has many national parks while South Chungcheong has some famous hot springs. 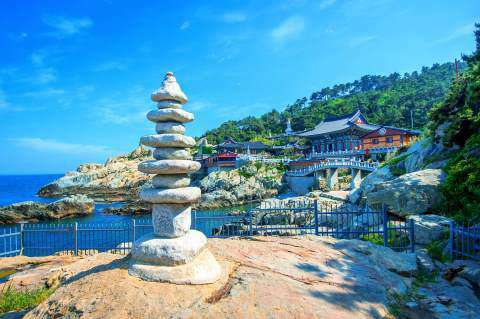 North Gyeongsang is the place to go if you're looking for history and culture, but South Gyeongsang has many impressive temples and some nice seaside communities. Finally, Jeju is a notable honeymoon destination for Koreans. Whether you're visiting Korea for work or pleasure, you are sure to be welcomed openly into the homes of many Koreans. You'll quickly be made to feel right at home and you'll have a memorable and unique experience during your time here. Public transportation in South Korea is very modern and easy to use. There are trains, buses, and planes that connect most cities. Most larger cities also have their own subway system which is usually modern and efficient. You can also travel around town by taxi or by public bus. Although there is almost every form of transportation you could need throughout the country, you'll usually get the best price if you take the bus. This may also be the slowest form of transportation however. South Korea sells a KR Pass to any foreign non-resident visiting the country. The pass offers unlimited travel for a set period of time on Korail train. There are many restrictions on the pass so you should really consider the cost effectiveness of purchasing it before paying the money. First class and sleeping cars are not included on the pass and the limitations are even stricter during holiday and peak periods of travel. In order to make up for the cost of the pass you will have to plan some long, frequent trips through the country. If you do decide to buy a KR Pass it must be purchased five days in advance. Karaoke, commonly referred to as noraebang, is a popular activity in most major cities around South Korea. You should try this at least once if you're looking for the full cultural experience. If you're in the country in the middle of July head to the city of Boryeong in Chunchungnam. They host a famous Mud Festival that is popular throughout the country. Participants are covered in a thick mud and participate in any number of activities which range from body painting to mud wrestling. There's also a nearby beach that hosts countless parties during this time. If you're planning to go to the festival make sure you reserve a hotel room well in advance as places tend to fill up. Although there are ATMs throughout the country, it can be quite difficult to find one that accepts foreign cards. Look for a Citibank ATM or the special Global ATMs. These are most frequently found in airports, subway stations and Family Mart convenience stores. If you're heading out of the major cities make sure you carry plenty of cash with you. Traveling alone to Seoul or Tokyo? Are you a student looking for a hostel in South Korea? Find the best hostels throughout South Korea. Korean Demilitarized Zone: This area separating North and South Korea is commonly referred to as the most heavily armed area in the world. It was originally established by a cease-fire in 1953. The mysterious nature of North Korea and the ominous descriptions of this area attract tourists from around the world. The general area covers about 2 kilometers between the two countries. Gyeongju: Located in the North Gyeongsang province, this is the former capital of Silla. It has many historic and cultural sights with some of the most popular being Gyeongju National Park, Bulguksa Temple, and Seokguram Grotto. Jeju Island: Off the southern coast of Korea, this island is a top honeymoon destination both inside and outside of Korea. It was formed by a volcano and offers beautiful scenery and fun activities including horseback riding and hiking. Korean food is growing in popularity throughout Europe and the United States. The meals are usually based around a rice, a soup, and a protein like fish or meat. These staples are accompanied by an assortment of side dishes which are referred to as banchan. Kimchi: This is the most famous and popular banchan dish. It is served as an accompaniment to most Korean meals and it's made from fermented cabbage and chili. Be careful though because it can be very spicy. Doenjang: This is another side dish that is served with most meals. It's made from a fermented soybean paste and is comparable to Japanese miso. Bulgogi: This is a type of Korean barbeque that is made from various marinated meats. Diners generally cook the meat at the table on a charcoal grill. If you're looking for a local and traditional souvenir you have a few good options throughout South Korea. Ginseng tea is a popular purchase and the best place to buy it is Gyeongdong Herbal Medicinee Market in Seoul. Other items include a blue-jade celadon from the Goryeo Dynasty, handmade costumes, paper kites, and other such things that can be found at markets throughout the country.